Disclaimer – This website is a public resource of general information concerning our law firm. It is intended, but not promised or guaranteed, to be correct, complete, and up-to-date. The website is not intended to be a source of legal advice. Links on this website are not intended to be referrals or endorsements of the linked entities. The lawyers identified on the website are licensed to practice law in the State of Georgia. Our firm does not intend to represent anyone desiring representation in a state where this website fails to comply with all laws and ethical rules of that state. No one reading this site should act or refrain from acting based on information from this web site, regardless of whether they are a current or past client. 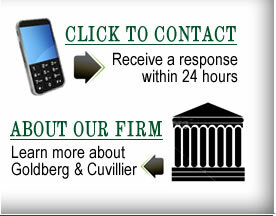 Goldberg & Cuvillier, P.C. expressly disclaims all liability with respect to actions taken or not taken based on any or all of the contents of this site. Note: Nothing in this website creates or establishes an attorney-client relationship.